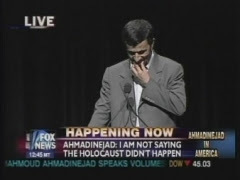 Iranian president Mahmoud Ahmadinejad's claim at Columbia University, that Iran did not have homosexuals "like in your country" has made world headlines. To be fair to Ahmadinejad, he was possibly not denying Iranian homosexuality so much as the existence of an overt homosexual subculture such as is common in Western countries. Iran doesn't have an open homosexual subculture, because Iranian homosexuals are not stupid enough to flaunt their sexual orientation. If they did, they might well end up like the Iranian homosexual mentioned in this post. The derision was because Iran executes male homosexuals, even teenage ones, in public, at mass executions in the soccer stadium in Teheran. The public nature of the executions, which are witnessed by huge crowds, cannot be denied by the very nature of their being in public, with many photos posted on the Net by members of the "audience." Iran also executes female adulterers at the same soccer stadium in the same public manner. Execution is carried out by hanging, with the noose fixed to the boom of a mobile crane, the boom being raised to lift the hapless victim who hangs there in front of the mob until they die. What a barbaric regime, one of the worst in the world from the human rights perspective. Chilling stuff e.r.-what do you think of our government trading with the barbarians? I wonder how can Chavez supporters justify their boy siding with someone like Ahmadinejad.